Is this not beautiful? It is an altered CD. Yes CD as in compact disc. Inspiration comes from everywhere. What a great idea. 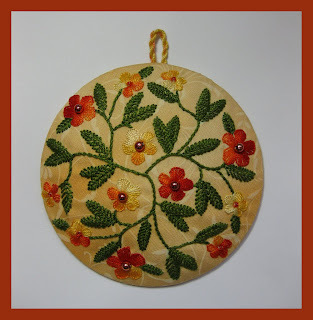 It could be done with hand embroidery or machine embroidery. I agree with Laurie, you are such a tease! Please tell us more. Aaah, the perfect circle form, and a workable size. The stitching is lovely!